Marie-Laurence Jocelyn Lassegue has resigned as Minister of Culture and Communication to take on the responsibilities as an appointee to the Superior Council of Administration and Civil Service (CSAFP). It is an uncompensated volunteer position she gladly assumes to work for the public benefit. She will retain her directorship of IDEA International though. Ms. Lassegue discussed with the media the work of the council, which is to restructure public management of government and human resource services. Initiatives are generated by the council to weed out inefficient and duplicated practices within the Civil Service agency. She said she will use the skill set she acquired as a minister to work for the betterment of the Civil Service agency. At CSAFP meetings, the board takes up problems concerning mis-management issues and its effect on public service deliverables. CSAFP also functions as a resource for the Office of Management and Human Resources, monitoring applications for appropriate responses to services needed. Ms. Lassegue has worked in public service since 1991, beginning as Minister of Information and Culture, then moving on to the Provisional Electoral Council as Secretary General. 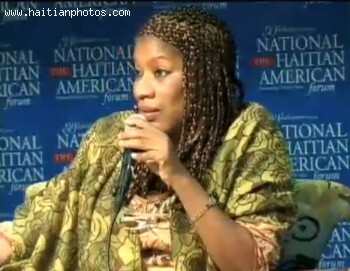 In 1995, she was a cabinet member of the government of Haiti and rose to a position in the president's office by 1996, for four years. In 2005, she was appointed to the Ministry for Women's Affairs and also the Ministry for the Rights of Women. She assumed the minister-ship for the Condition of Women and Women's Rights in 2006.